In a bowl sift together the flour, caster sugar and cinnamon. Add the thickened cream, stir to combine. Turn dough out onto a lightly floured surface and knead for one minute or until mixture comes together. Roll out into an approximate 24cm by 35cm rectangle. For the filling, beat together the butter, brown sugar, vanilla and cinnamon with electric beaters until pale and creamy. Set up your barbecue for indirect cooking. Please refer to your handbook for further instructions. Preheat your barbecue for baking. Spread the buttercream over the rolled out dough, sprinkle the chopped pecans on top. Roll the dough into a log. Cut into 12 equal portions. Place the scrolls into a lightly greased Large Weber Q Ware Frypan, arranging them 1cm apart. Using a pastry brush, brush the scrolls with the milk. Once the barbecue has preheated, make adjustments to the burner control(s) if required for the baking setting. Place the scrolls on and cook for 30-35 minutes. 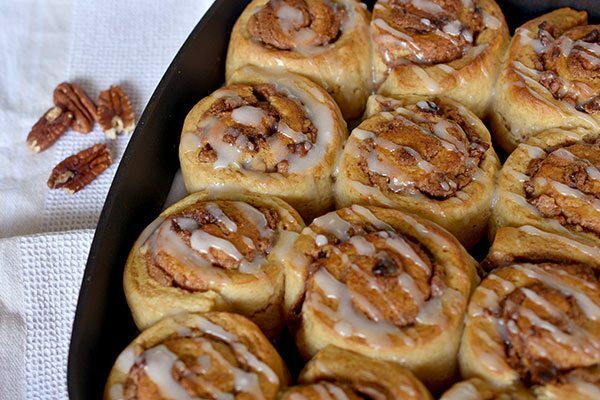 While the scrolls are cooking, make the icing glaze. In a small bowl whisk the icing sugar and 1 tablespoon of the extra milk. Once the scrolls are cooked, remove from the barbecue and set aside for 5 minutes to cool slightly. Finish with a drizzle of the icing glaze. Serve warm or at room temperature.